Every year, thousands of tourists from around the world take a long flight across the South Pacific to see the famous stone statues of Easter Island. Since 1722, when the first Europeans arrived, these megalithic figures, or moai, have intrigued visitors. Interest in how these artifacts were built and moved led to another puzzling question: What happened to the people who created them? Figure 1. 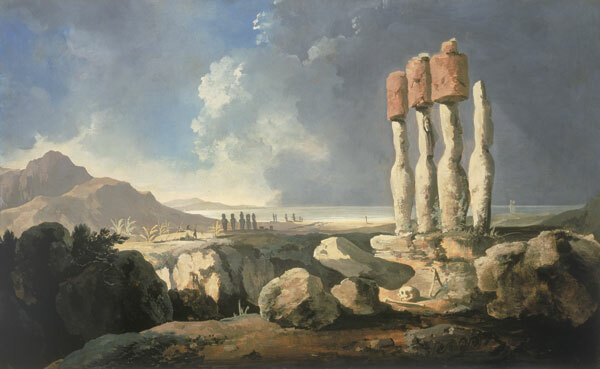 British artist William Hodges traveled to Easter Island (or Rapa Nui, as the island’s inhabitants refer to it) in the 1770s, inspiring this painting of several of the stone statues that have made this locale famous. The island continues to draw both tourists and scientists, in part because of the mystery surrounding the fate of its civilization. A popular account of Rapa Nui’s history casts the inhabitants as the perpetrators and victims of an ecological catastrophe that resulted from overexploiting the island’s resources. New evidence from archaeological work and comparative ecology, however, reveals that this story may need to be rewritten. In the prevailing account of the island's past, the native inhabitants—who refer to themselves as the Rapanui and to the island as Rapa Nui—once had a large and thriving society, but they doomed themselves by degrading their environment. 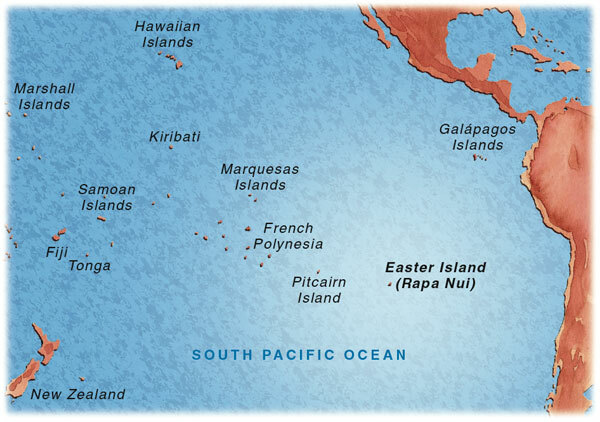 According to this version of events, a small group of Polynesian settlers arrived around 800 to 900 A.D., and the island's population grew slowly at first. Around 1200 A.D., their growing numbers and an obsession with building moai led to increased pressure on the environment. By the end of the 17th century, the Rapanui had deforested the island, triggering war, famine and cultural collapse. Jared Diamond, a geographer and physiologist at the University of California, Los Angeles, has used Rapa Nui as a parable of the dangers of environmental destruction. "In just a few centuries," he wrote in a 1995 article for Discover magazine, "the people of Easter Island wiped out their forest, drove their plants and animals to extinction, and saw their complex society spiral into chaos and cannibalism. Are we about to follow their lead?" In his 2005 book Collapse, Diamond described Rapa Nui as "the clearest example of a society that destroyed itself by overexploiting its own resources." Two key elements of Diamond's account are the large number of Polynesians living on the island and their propensity for felling trees. He reviews estimates of the island's native population and says that he would not be surprised if it exceeded 15,000 at its peak. Once the large stands of palm trees were all cut down, the result was "starvation, a population crash, and a descent into cannibalism." When Europeans arrived in the 18th century, they found only a small remnant of this civilization. Diamond is certainly not alone in seeing Rapa Nui as an environmental morality tale. In their book Easter Island, Earth Island, authors John R. Flenley of Massey University in New Zealand and Paul G. Bahn worried about what the fate of Rapa Nui means for the rest of human civilization: "Humankind's covetousness is boundless. Its selfishness appears to be genetically inborn…. But in a limited ecosystem, selfishness leads to increasing population imbalance, population crash, and ultimately extinction." When I first went to Rapa Nui to conduct archaeological research, I expected to help confirm this story. Instead, I found evidence that just didn't fit the underlying timeline. As I looked more closely at data from earlier archaeological excavations and at some similar work on other Pacific islands, I realized that much of what was claimed about Rapa Nui's prehistory was speculation. I am now convinced that self-induced environmental collapse simply does not explain the fall of the Rapanui. Radiocarbon dates from work I conducted with a colleague and a number of students over the past several years and related paleoenvironmental data point to a different explanation for what happened on this small isle. The story is more complex than usually depicted. The first colonists may not have arrived until centuries later than has been thought, and they did not travel alone. They brought along chickens and rats, both of which served as sources of food. More important, however, was what the rats ate. These prolific rodents may have been the primary cause of the island's environmental degradation. Using Rapa Nui as an example of "ecocide," as Diamond has called it, makes for a compelling narrative, but the reality of the island's tragic history is no less meaningful. Figure 2. Often referred to as the most isolated habitable island in the world, Rapa Nui lies more than 2,000 kilometers from Pitcairn Island and more than 3,000 kilometers from Chile, which annexed the island in 1888. More than 3,000 kilometers of ocean separate Rapa Nui from South America, the nearest continent. The closest habitable island is Pitcairn (settled by the infamous Bounty mutineers in the 18th century), which lies more than 2,000 kilometers to the west. Rapa Nui is small, only about 171 square kilometers, and it lies just south of the tropics, so its climate is somewhat less inviting than many tropical Pacific islands. Strong winds bearing salt spray and wide fluctuations in rainfall can make agriculture difficult. The flora and fauna of Rapa Nui are limited. Other than chickens and rats, there are few land vertebrates. Many of the species of birds that once inhabited the island are now locally extinct. Large palm trees from the genus Jubaea long covered much of the island, but they, too, eventually disappeared. A recent survey of the island found only 48 different kinds of native plants, including 14 introduced by the Rapanui. Figure 3. Although it is a small island, Rapa Nui has an abundance of archaeological riches. The author led excavations on Anakena Beach, thought to be the location of the earliest human settlements. Other important archaeological sites include three crater-tipped peaks—Rano Kau, Rano Aroi and Rano Raraku—and the Poike Peninsula. Black dots indicate the positions of numerous ahu, foundation stones supporting the island’s impressive carved-rock statues. Accounts by European visitors to Rapa Nui have been used to argue that by the time of European discovery in 1722 the Rapanui were in a state of decline, but the reports are sometimes contradictory. In his log, Dutch explorer Jacob Roggeveen, who led the first Europeans to set foot on Rapa Nui, portrayed the island as impoverished and treeless. After they left, however, Roggeveen and the commanders of his three ships described it as "exceedingly fruitful, producing bananas, potatoes, sugar-cane of remarkable thickness, and many other kinds of the fruits of the earth…. This land, as far as its rich soil and good climate are concerned is such that it might be made into an earthly Paradise, if it were properly worked and cultivated." In his own account of the voyage, one of Roggeveen's commanders later wrote that he had spotted "whole tracts of woodland" in the distance. A 19th-century European visitor, J. L. Palmer, stated in the Journal of the Royal Geographic Society that he had seen "boles of large trees, Edwardsia, coco palm, and hibiscus." Coconut trees are a recent introduction to the island, so Palmer might have seen the now-extinct Jubaea palm. Clearly the historical record leaves many gaps to be filled. Scientists have long tried to provide more definitive answers about Easter Island's prehistory, but at times have instead contributed to the confusion. Norwegian explorer and anthropologist Thor Heyerdahl, for example, visited Rapa Nui in the 1950s and sparked widespread interest in the moai and the large stone foundations, or ahu, on which they were often placed. But he also helped to spread some misleading conclusions. Heyerdahl believed that the Polynesian islands, including Rapa Nui, were settled by voyagers from South America rather than from the western Pacific. In 1947, he launched his famous Kon-Tiki expedition, directing a small craft made of wood and other basic materials from Peru to the Tuamotu Islands to prove that the journey would have been possible for prehistoric peoples. Figure 4. Thor Heyerdahl, an anthropologist and explorer, was as famous for his adventurous spirit as for his scientific career. In 1955, he traveled to Rapa Nui to conduct archaeological work. His time there brought greater attention to this far-flung destination but also contributed to the popularity of a number of incorrect conclusions about the island’s history. 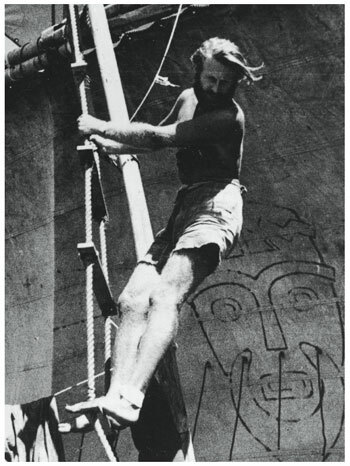 Here, Heyerdahl is pictured on the Kon-Tiki, a small balsa-wood boat that Heyerdahl and several crew members sailed from South America to a Polynesian island in 1947. In 1955, Heyerdahl led an archaeological expedition on Rapa Nui. He argued that the island had been settled from the east, and he pointed to similarities between the island's statues and South American stonework. Linguistic and genetic evidence have firmly established the Polynesian origin of the Rapanui, but Heyerdahl's conclusions still cloud the archaeological record. A charcoal sample uncovered on Poike Peninsula—marking, presumably, the site of an ancient hearth—was dated to about 400 A.D. Combined with the then-prevailing idea that the Rapanui language showed many centuries of isolation from other Polynesian groups, the radiocarbon date from this charcoal sample led scholars to conclude that human settlement here began about 400 A.D.
More recently, however, archaeologists have rejected the Poike Peninsula date. Likewise, others have questioned whether the linguistic evidence reflects Rapanui's isolation instead of early settlement. This later phase of research began to point to 800-900 A.D. as the earliest likely date of human colonization. Although archaeologists have indeed focused a great deal of effort on establishing just when the island was settled, much of their work has been dedicated to studying the changes that these colonists brought about, especially deforestation. Heyerdahl's team took pollen samples that showed that palm trees had once been abundant on the island. In the course of their excavations, members of the expedition also found telltale features where roots had once grown, indicating more widespread vegetation in the past and pointing to the possibility that humans had caused the loss of forest cover. Flenley has provided much of the more recent detailed evidence in this area. 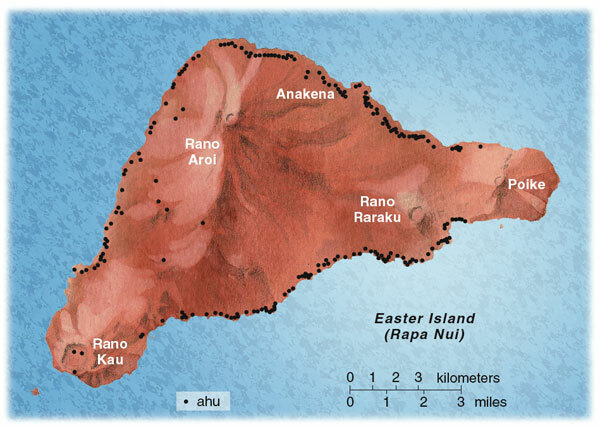 In the late 1970s and 1980s, he collected and analyzed sediment core deposits from three areas: Rano Aroi, a crater near the island's center; Rano Raraku, a crater adjacent to the quarry where many of the statues were carved; and Rano Kau, a crater in the southwest corner of the island. Each of these depressions hosts a shallow lake, which collects wind-blown sediment from elsewhere on the island. The best evidence came from a 10.5-meter core from Rano Kau, which showed that the island had been forested for tens of thousands of years before the trees disappeared, a process that took place between 800 and 1500 A.D. But more recently Flenley and other scientists have raised doubts about the validity of these dates, which were derived from measurements of the radiocarbon age of lake sediment samples. In 2004, Kevin Butler of Massey University, Christine A. Prior of Rafter Radiocarbon Laboratory and Flenley showed that bulk sediment samples from such locales often contain some carbon that is considerably older than the time of deposition, suggesting that the chronology Flenley first proposed may be hundreds of years too old in dating human-induced forest clearance. Other recent archaeological and paleo-environmental work has also challenged long-held assumptions about Rapa Nui's prehistory. Catherine Orliac of the Centre national de la recherche scientifique in France has conducted a remarkable study of 32,960 specimens of woods, seeds, fibers and roots. In addition to identifying 14 taxa not previously observed on the island, she showed that the primary source of fuel for the Rapanui changed in a dramatic fashion. Between 1300 and 1650 A.D., inhabitants burned wood from trees, but they used grass, ferns and other similar plants for fuel after that point. Orliac also argued, however, that at least 10 taxa of forest vegetation may have persisted until Europeans began visiting the island. In another study, Orliac examined the remains of the hard shells surrounding the seeds of the Jubaea palm. Those samples that were carbonized, gnawed by rats or found in association with human materials provided evidence of human habitation on the island. She dated a number of such remains and found that they all fell after 1250 A.D.
Ecologists Andreas Mieth and Hans-Rudolf Bork of Christian-Albrechts-University Kiel in Germany have studied the process of deforestation on Rapa Nui. Using a variety of evidence, primarily from Poike Peninsula, they concluded that Jubaea palms once covered most of the island. Around 1280 A.D., they argued, deforestation began. The Rapanui largely abandoned the peninsula within 200 years, but then they resettled it in some areas from about 1500 A.D. to 1675 A.D. In 2003, geologist Dan Mann and several colleagues obtained radiocarbon dates not from bulk samples, but from bits of charcoal found in soils from a number of locations around the island. They also documented ancient episodes of severe erosion, which according to their radiocarbon measurement began soon after 1200 A.D. Their study, like that of Mieth and Bork, pointed to deforestation taking place between 1200 and 1650 A.D., with no sign of human impact prior to that period. Both Mann's team and Mieth and Bork reconciled their findings with earlier work by arguing that the population during the centuries prior to 1200 A.D. must have been small or transient. It was only once the number of permanent inhabitants grew larger that indications of human presence would have become clear in the paleoenvironmental record. But this scenario makes several questionable assumptions. It requires a small founding population with a slow rate of growth and little ecological impact. After conducting our own research on Rapa Nui, we began to wonder whether the lack of evidence of human presence prior to about 1200 A.D. should be taken at face value—maybe the island hadn't actually been settled as early as most people assumed. I did not expect when I first visited Rapa Nui, in May 2000, that I would end up questioning what I thought I knew about the island's past. Indeed, my initial trip to the island was primarily as a tourist, not as an archaeologist. But while I was there, I ran into Sergio Rapu, the first native Rapanui governor of the island and a former student of mine—Rapu had studied archaeology as a graduate student at the University of Hawaii. He invited me to do research on Rapa Nui. Before that point, the thought of doing work there had not really crossed my mind. I had been planning to lead a continuing archaeological field school in Fiji later that summer, but when a violent coup d'état began there that May, my enthusiasm waned. Rapa Nui now seemed an increasingly appealing place to hold the field school sessions. I anticipated that the work of my students and I, which we began in August 2000, would help put the finishing touches on a well-established story. But as I began to review archaeological survey data, studies of the moai and evidence for environmental changes, I realized that there were a number of gaps in what was known about Rapa Nui, and I grew increasingly skeptical of everything said about the island's prehistory. Over the next few years, my students and I conducted field work for one or two months each year. My colleague Carl P. Lipo, an archaeologist at California State University, Long Beach, joined the effort and introduced me to the potential of satellite imagery, which we used to explore features such as the ancient roads on which the Rapanui transported the moai from the quarry at Rano Raraku to every corner of the island. Following road alignments also led to the documentation of a number of moai that were previously unrecorded. In 2004, we began new excavations at a locale called Anakena. This white sand beach would have been the most inviting spot for the first colonists to land their boats (the shore in other places is for the most part made up of cliffs or rocky crags). Hence most anthropologists suspect the areas around Anakena to be the site of the earliest settlements. We intended to study subsistence and environmental change, not basic chronology, which we assumed was already settled. We dug through sand whose beautifully undisturbed stratification proved to be an archaeologist's dream. The integrity of the layers would be helpful in determining when things happened, both in an absolute sense and relative to other events. But the excavations were not easy. The sand at Anakena is soft and unconsolidated. As we dug down a few meters, the pits became increasingly dangerous. Horses trotting by on the beach would cause nerve-wracking vibrations in the layers of sand; we worried someone would be buried alive in the pit. Finally, we reached the bottom of the sand. In the top 3 to 5 centimeters of the underlying clay we unearthed abundant charcoal fragments (indicating the use of fire), bones (including those of the Polynesian rat, a species that arrived with the colonists) and flaked obsidian shards (a clear sign of human handiwork). Below, we found nothing suggesting human activity. Instead, the ancient clay was riddled with irregular voids—places where the soil had once molded itself around the roots of the long-gone Jubaea palm tree. Figure 5. In 2004 and 2005, the author led excavations on Anakena Beach and found evidence that humans arrived on the island only about 900 “radiocarbon years” ago, which after applying the relevant corrections corresponds to around 1200 A.D. 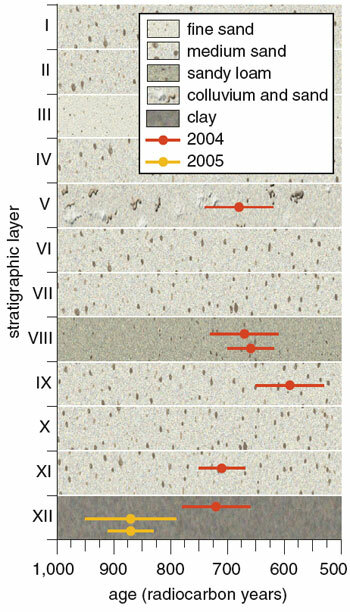 Eight dates (with error bars) from charcoal samples found during the digs are mapped onto the stratigraphic layer in which they were found (layers are not drawn to scale). We had clearly found the layer with the earliest human-related materials at Anakena, and assuming that Anakena was likely the location of the first settlements on the island, we were in an excellent position to ascertain the timing of the initial colonization. So I was disappointed when I received an e-mail from the lab that did the radiocarbon dating on these samples. There seemed to be a mistake. The oldest dates were only about 800 years old, implying that occupation began around 1200 A.D. The dates from layers closer to the surface were progressively younger, which is inconsistent with the possibility that somehow our samples were contaminated with modern carbon. There was really no way to explain these numbers, at least not within the conventional model of Rapa Nui's development. I put aside the discouraging message for the moment and decided to try to figure out later what had gone wrong. When the hardcopy of the report arrived a couple of weeks later, I examined the data again. The closer I looked, the more it seemed that our results were not the problem. I spoke with my friend and colleague Atholl Anderson of the Australian National University. He had done a careful screening of radiocarbon dates from New Zealand and concluded that the first settlers arrived there around 1200 A.D., several hundred years later than archaeologists had previously believed. The reaction to his ideas was initially quite cool, but time and additional evidence have proved him correct. Having had this experience, Anderson advised me to keep an open mind and to trust my data more than any preconceptions. In 2005, Lipo and I returned with our students to Anakena and located another part of the dune where the deepest layers containing vestiges of occupation would be easier to expose. We uncovered a large area of the clay beneath the sand and took samples for more radiocarbon dating. The two additional dates from the basal layer were completely consistent with our earlier results. Figure 6. Prior studies of samples containing indications of human presence on the island (bits of charcoal, for example, suggesting human-set fires blazed nearby) yielded 45 published radiocarbon dates older than 750 years (left). Yet after the author and colleague Carl Lipo culled these data using accepted reliability criteria, only nine dates remained (shaded portions of bars). The majority of the accepted results had radiocarbon ages close to 900 years (approximately 1200 A.D.). The single sample giving an earlier radiocarbon age showed large measurement uncertainties, corresponding to a broad range of possible dates between 657 A.D. and 1180 A.D., so it, too, is compatible with the notion that people arrived on the island around 1200 A.D. Studies of deforestation on Rapa Nui have found signs of human activity beginning about 800 years ago (right). One explanation for the lack of evidence of human activity before this point is that the initial population was small and had little environmental impact. But it may be that humans simply did not arrive until about 800 years ago. Was the conventional chronology just plain wrong? Lipo and I took a closer look at the evidence for earlier human settlement. We evaluated 45 previously published radiocarbon dates indicating human presence more than 750 years ago using a "chronometric hygiene" protocol. We rejected dates measured from unreliable sources, such as marine organisms, which require corrections for the older carbon from the marine environment. We also rejected single dates that were not confirmed by a second date from the same archaeological context. Using only paired dates helps ensure the reliability of the data. Our standards were more inclusive than those used by Anderson in his study of New Zealand, but we still were left with only nine acceptable dates. With this culling, the evidence for first occupation around 800 A.D. simply fell apart. Although our results did not fit with the accepted settlement date for Rapa Nui, they did match the chronology for deforestation that Orliac, Mann, and Mieth and Bork had worked out. You merely have to abandon the idea that a small or transient population endured for centuries. Instead, we posit that from the start the environmental impact was widespread. The notion that humans did not arrive on Rapa Nui until about 1200 A.D. was not the only thing causing me to rethink my assumptions about the island. Research on other Pacific islands provides a compelling parallel and a possible explanation for the damage done to Rapa Nui's environment. Figure 7. For thousands of years, large stands of palm trees covered much of the island. The closely related Jubaea chilensis (left) still survives in Chile and elsewhere, but the trees disappeared from Rapa Nui in the centuries after people arrived. The landscape remains largely denuded today, as seen in this view of the area around Ahu Tongariki (right). Although people were probably responsible for some portion of the deforestation, the principal cause was a swelling population of Polynesian rats (bottom), which eat palm nuts and in so doing make it difficult for these trees to regenerate. Photograph at left by Humberto Olea. Photograph at right courtesy of Terry L. Hunt. Photograph at bottom by Brian Enting/Photo Researchers, Inc.
By the time the second round of radiocarbon results arrived in the fall of 2005, a complete picture of Rapa Nui's prehistory was falling into place. The first settlers arrived from other Polynesian islands around 1200 A.D. Their numbers grew quickly, perhaps at about three percent annually, which would be similar to the rapid growth shown to have taken place elsewhere in the Pacific. On Pitcairn Island, for example, the population increased by about 3.4 percent per year following the appearance of the Bounty mutineers in 1790. For Rapa Nui, three percent annual growth would mean that a colonizing population of 50 would have grown to more than a thousand in about a century. The rat population would have exploded even more quickly, and the combination of humans cutting down trees and rats eating the seeds would have led to rapid deforestation. Thus, in my view, there was no extended period during which the human population lived in some sort of idyllic balance with the fragile environment. Figure 8. New evidence casts doubt on the traditional history of Rapa Nui. The popular narrative of environmental collapse hinges on early colonization and a large peak population (top). A revised timeline that takes into account recent radiocarbon dates points to initial settlement around 1200 A.D. (bottom). According to this version of events, the human population never grew much larger than about 3,000, and rats played a dominant role in the deforestation of the island. In this scenario, the Rapanui culture did not decline significantly until after the arrival of Europeans. Within about a century and half of initial contact, however, disease and enslavement reduced the Rapanui population to approximately 100. It also appears that the islanders began building moai and ahu soon after reaching the island. The human population probably reached a maximum of about 3,000, perhaps a bit higher, around 1350 A.D. and remained fairly stable until the arrival of Europeans. The environmental limitations of Rapa Nui would have kept the population from growing much larger. By the time Roggeveen arrived in 1722, most of the island's trees were gone, but deforestation did not trigger societal collapse, as Diamond and others have argued. There is no reliable evidence that the island's population ever grew as large as 15,000 or more, and the actual downfall of the Rapanui resulted not from internal strife but from contact with Europeans. When Roggeveen landed on Rapa Nui's shores in 1722, a few days after Easter (hence the island's name), he took more than 100 of his men with him, and all were armed with muskets, pistols and cutlasses. Before he had advanced very far, Roggeveen heard shots from the rear of the party. He turned to find 10 or 12 islanders dead and a number of others wounded. His sailors claimed that some of the Rapanui had made threatening gestures. Whatever the provocation, the result did not bode well for the island's inhabitants. In the 1930s, French ethnographer Alfred Metraux visited the island. He later described the demise of Rapa Nui as "one of the most hideous atrocities committed by white men in the South Seas." 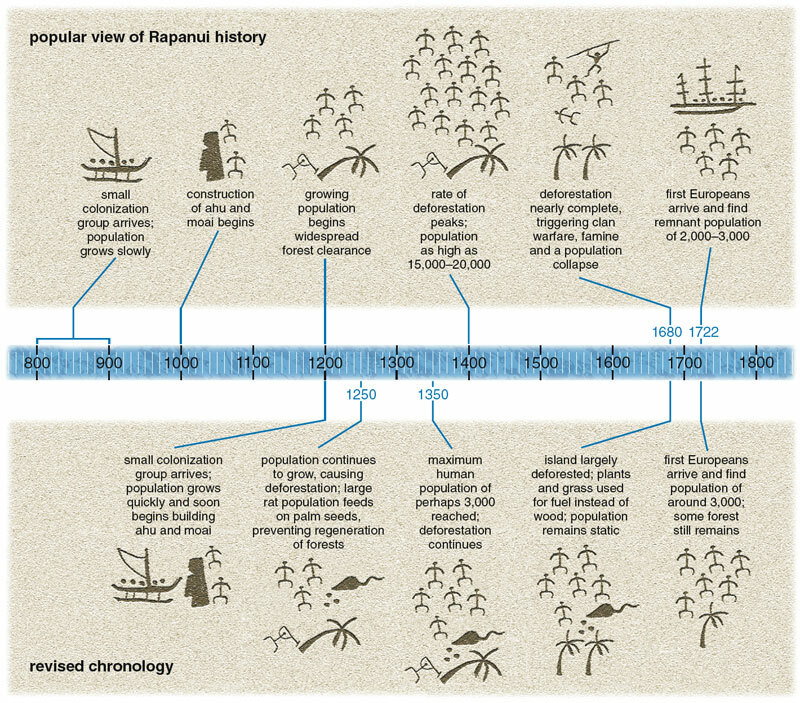 It was genocide, not ecocide, that caused the demise of the Rapanui. An ecological catastrophe did occur on Rapa Nui, but it was the result of a number of factors, not just human short-sightedness. Ecosystems are complex, and there is an urgent need to understand them better. 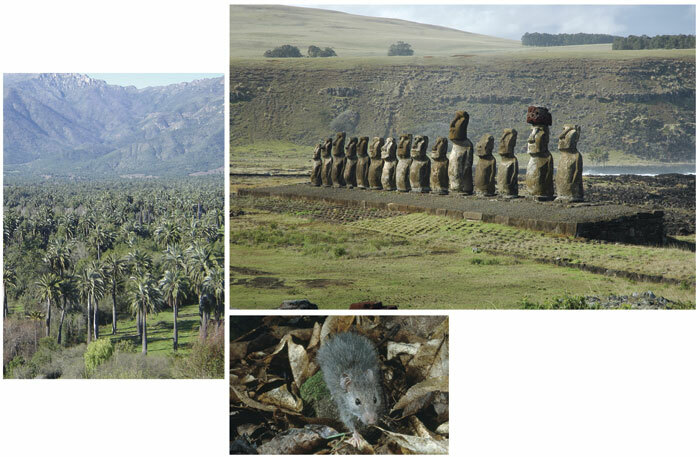 Certainly the role of rats on Rapa Nui shows the potentially devastating, and often unexpected, impact of invasive species. I hope that we will continue to explore what happened on Rapa Nui, and to learn whatever other lessons this remote outpost has to teach us.